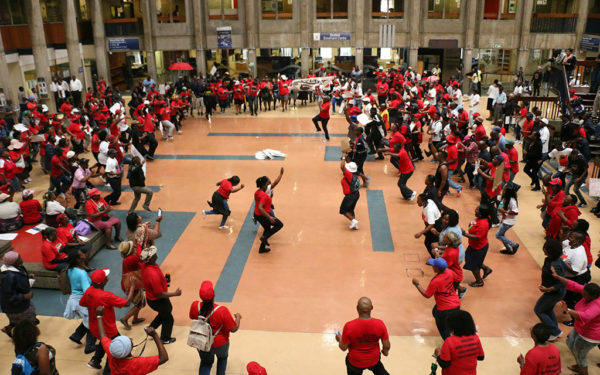 Wits University staff affiliated to the National Education, Health and Allied Workers’ Union (Nehawu) have embarked on a strike following a deadlock in salary negotiations with the institution on Tuesday, January 23. This follows two weeks of lunchtime pickets during which the union engaged university management over annual salary increases. Wits Nehawu acting secretary and spokesperson for the Unions’ Caucus – the joint representative body for Nehawu, the Academic Staff Association of Wits University (Asawu), the Admin and Library Staff Association (Altsa) and the National Union of Metalworkers of South Africa (Numsa) at Wits – Tumisho Madihlaba, told about 500 Nehawu members during Tuesday’s picket that Wits management had only revised the offer for grades 16 to 17 to 8% while the offer of 6,8% for all other grades remained the same. “They are saying they do not have a mandate to renegotiate or review the offer,” Madihlaba added. Members of Nehawu at Wits include staff of the security and cleaning services, sport administration, libraries and bus drivers. “Cost of living has not remained the same since December 2014 when we signed that multi-year agreement of 6%. But this university believes that the 6% of 2014, we will still survive on,” he said. Wits library staffer, Pisto Marema, told Wits Vuvuzela that union members were demanding a wage of at least R12 000 a month. “We need 9%. At least that can take us somewhere. As we sit now, most of us can’t even afford to apply for a bond,” said Marema. According to Madihlaba, Numsa and Asawu will be joining the strike as of today, January 24. A statement released earlier today by the office of the vice-chancellor, Prof Adam Habib, confirms that Numsa intends to strike and has given the university 48-hour notice of its intention to do so. Asawu is set to hold a Special General Meeting with its members on Friday, January 26. With less than two weeks before the academic year kicks off, Madihlaba added that strike action will continue until the union’s demands are met “We are going to shut down this university and management will not believe it,” he said.